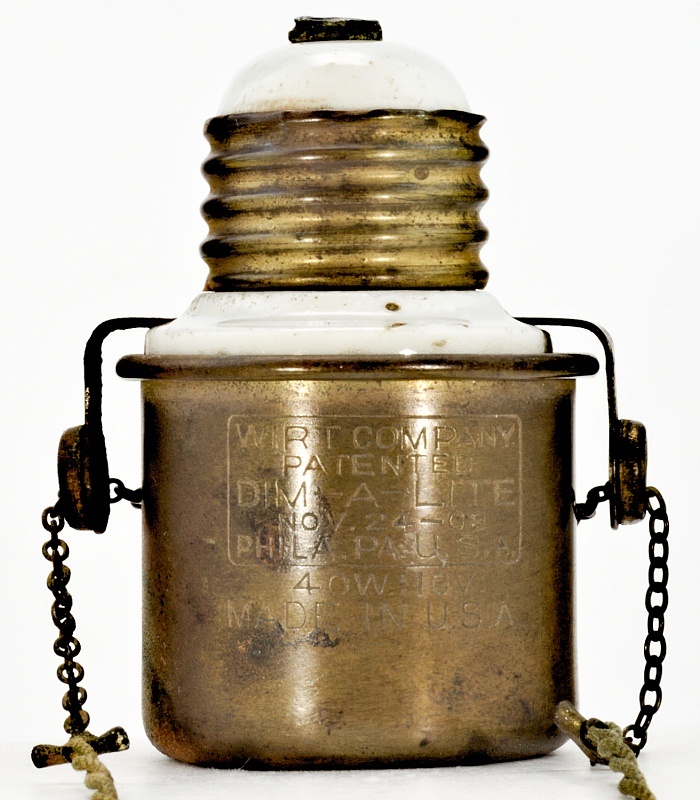 The Wirt Co. was founded in 1904 by Charles Wirt, an associate of Thomas Alva Edison. 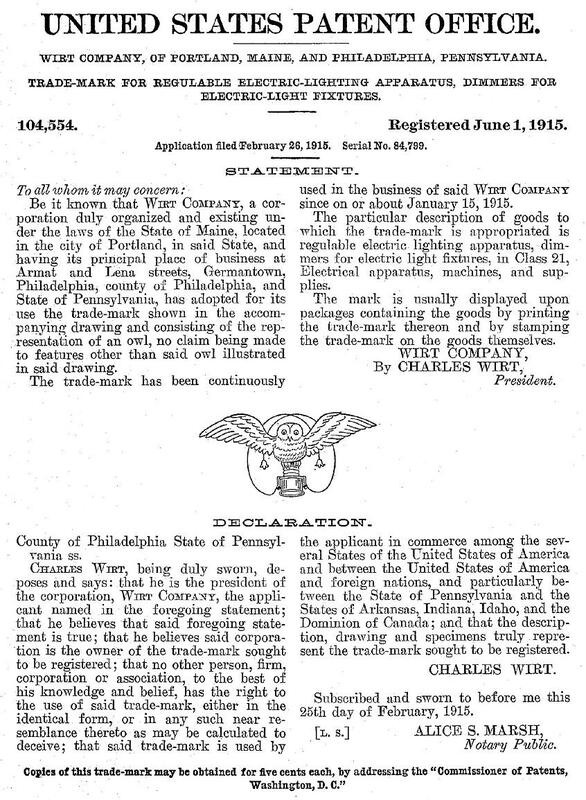 Their focus was electric specialties, and they are still in business today as CW Industries. 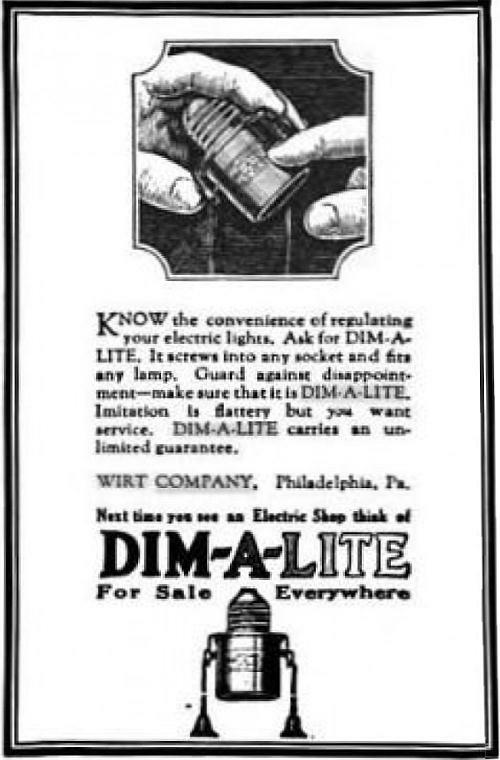 The DIM-A-LITE was one of their innovations, advertised as a way to “save current.” The eight-month advertising campaign advised that consumers could use their own bulbs and pull the string with the bright silver bell end to increase the light, pulling the dark colored bell string to reduce light. 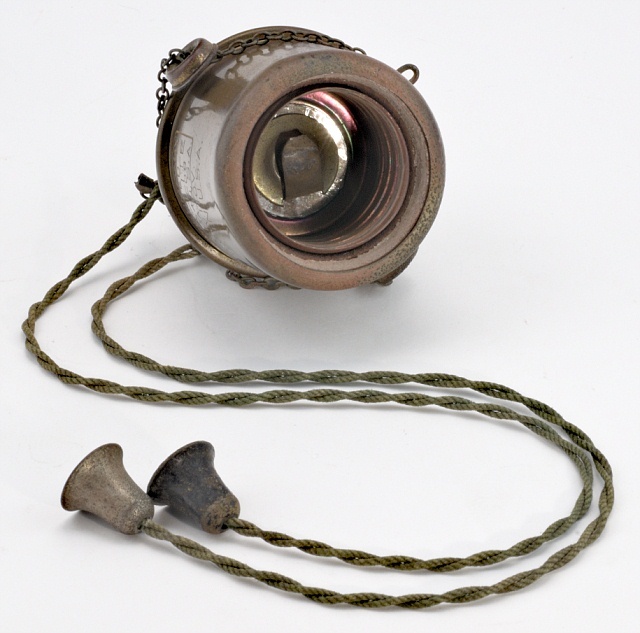 Furthermore, it screwed into any socket and fit any lamp. 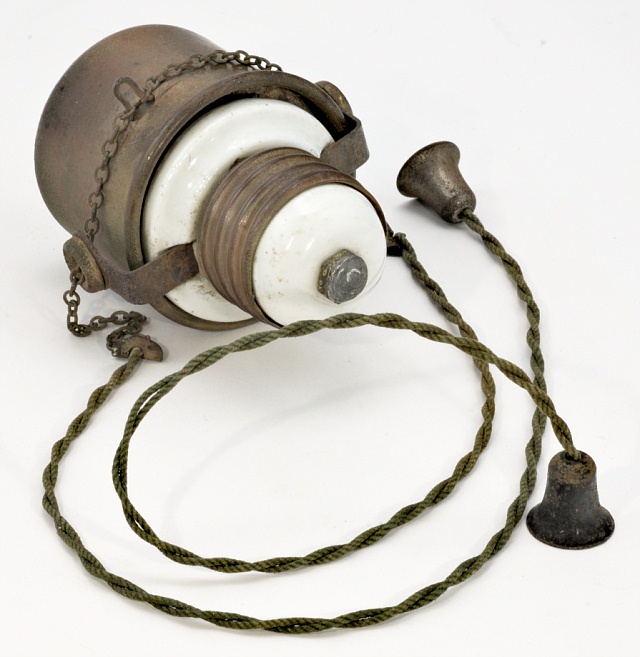 A miniature rheostat or resistance unit is enclosed in the lamp socket. 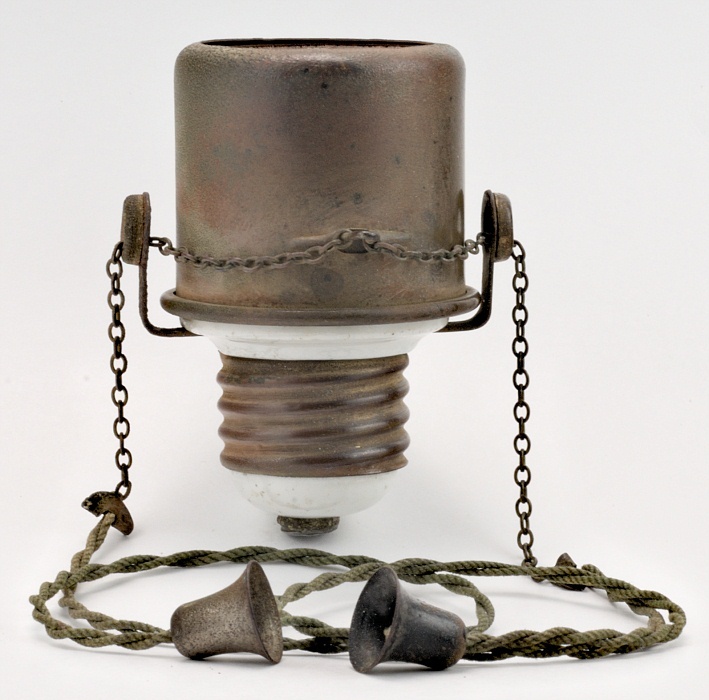 The lamp, when placed on the DIM-A-LITE, makes electrical contact as in an ordinary socket but with the difference that in series with the lamp filament is the rheostat, by means of which additional resistance may be added to change the current flowing in the lamp. The rheostat is so arranged that contact may be made at four different points in the resistance coil, through which the electricity may be varied from 100 to 20 per cent. of the normal quantity. The resistance in any case permits current to pass through the filament in amounts of 70, 30 and 20 per cent. of the normal amount. In use, the variation is made by pulling one string to add resistance and thus dim the light; or by pulling the other string, the resistance is decreased and more electricity passes through the filament to produce a brighter light. The quantity of light given out by the filament does not vary in the ratio of the added resistance but a variable light is obtained at the expense of a small amount of electricity which is changed into heat. When the light is burning at its dimmest only 20 per cent. of the normal current is used. 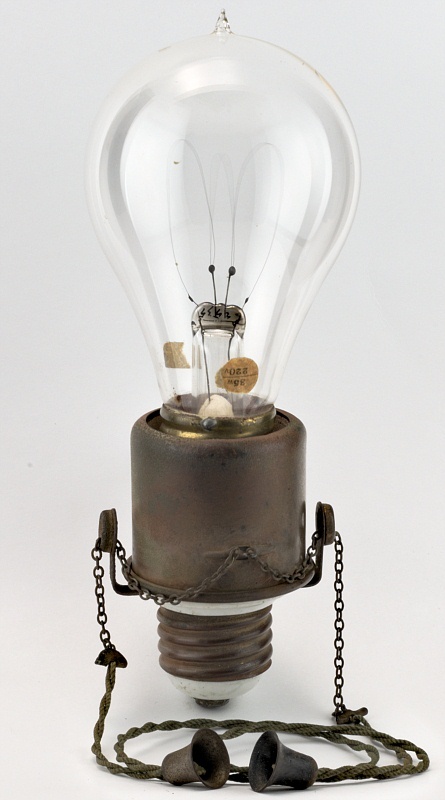 Under this condition the light given out by filament does not express the high efficiency attained when the lamp is burning at its full power but it does give a convenient form of light regulation with the minimum waste of energy. 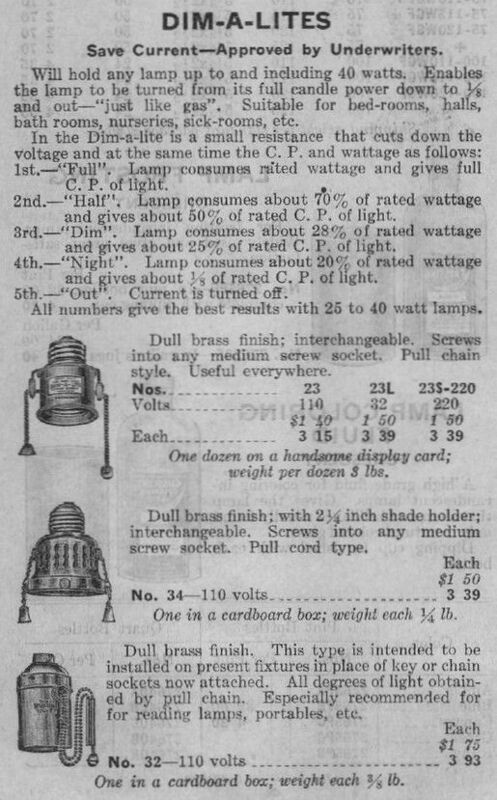 Patent: Charles Wirt, Lamp Reducer, Mar 18, 1907.